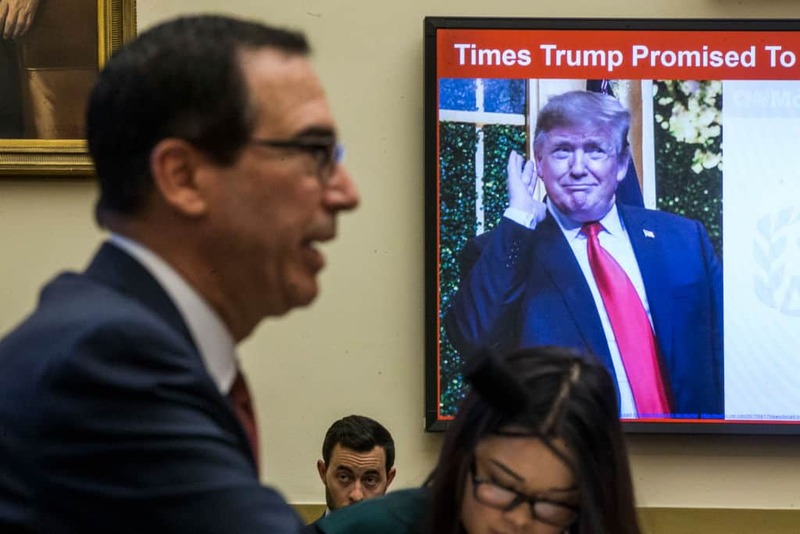 Steven Mnuchin Could Be Held In Contempt For Failing To Meet Trump Tax Return Deadline According To Dem Rep.
After Democrats on the House Ways and Means Committee demanded to see President Donald Trump’s tax returns — and after Treasury Secretary Steven Mnuchin said that he wouldn’t be able to procure them by a Wednesday night deadline — one Democratic member of the committee said it’s time to consider holding Mnuchin in contempt of Congress. Rep. Bill Pascrell (D-New Jersey) has been a longtime proponent of using Congressional authority in order to investigate Trump’s tax returns, which the president refused to make public during the 2016 campaign, even as other candidates for president have done so for decades before. Democrats last week demanded that the IRS turn over Trump’s records, establishing a deadline to do so by midnight on Wednesday of this week. Mnuchin announced that the IRS would be unable to do so, per reporting from the Los Angeles Times. Pascrell was outraged by the announcement, Politico reported on Thursday, and questioned why the deadline was missed as well as why Mnuchin, rather than IRS Commissioner Chuck Rettig, made the announcement. The request by Democrats was formally made to Rettig, not the Treasury Department. Mnuchin also said, in announcing the deadline being missed, that he would personally oversee the matter, as well as consult Department of Justice lawyers about his options. The Treasury Secretary’s response to the missed deadline upset Pascrell, to say the least. “I want to take a look at contempt of Congress here because the way Mnuchin talked and the way he writes, he’s very dismissive of the legislative branch of government, particularly if that part of the legislative branch of government is controlled by the Democratic Party,” Pascrell said. The New Jersey Democrat also took issue with Rettig, for failing to take the reins on the issue of collecting Trump’s tax returns and delivering them to Congress. Pascrell suggested that Rettig should resign if he’s not up to fulfilling his duties. A contempt of Congress requires a committee in either house to make the charge, after which the full house in which the complaint originated votes on the matter. A majority vote results in a contempt of Congress ruling, according to NBC News, which results in a punishment of up to $100,000 in fines, or a maximum prison sentence of one year.